Joe Angio is an award-winning documentary filmmaker and magazine editor. He is the co-producer, -director, and -editor (with Joel Cohen) of the documentaries More than a Game (1991), a 50-minute film on playground basketball in Chicago, and A Feast of Fools (1987), a 25-minute film on the clash of cultures at New Orleans's Mardi Gras. More than a Game has been broadcast in more than 25 countries and A Feast of Fools was awarded Best Documentary at the Festival of Illinois Film & Videomakers. How to Eat Your Watermelon in White Company (and Enjoy It), his first feature-length film, was awarded both the Lancia (jury) Award and Audience Award at the 2006 Biografilm Festival in Bologna, Italy. 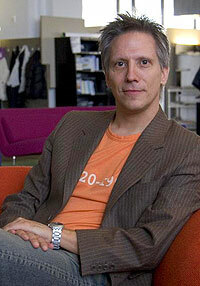 Angio is the former editor-in-chief of Time Out New York magazine, where he started in 1998 as executive editor. While at Time Out, Angio was nominated for three National Magazine Awards by the American Society of Magazine Editors and, in 2006, was awarded a gold medal for cover design by the Society of Publication Designers. Prior to Time Out, Angio was the articles editor at NBA Inside Stuff (1996–98) and the managing editor of Vibe (1995–96). Angio started his magazine career in 1993 as an associate editor at Men's Journal. From 1983 through 1991, Angio was a newswriter, assistant director, and associate producer for SportsChannel, Chicago. From 1989–91, he was also a producer and "video correspondent" for The 90's, a PBS magazine-style program that featured the work of independent filmmakers from around the world. Angio was born in Chicago and graduated from Milwaukee's Marquette University.